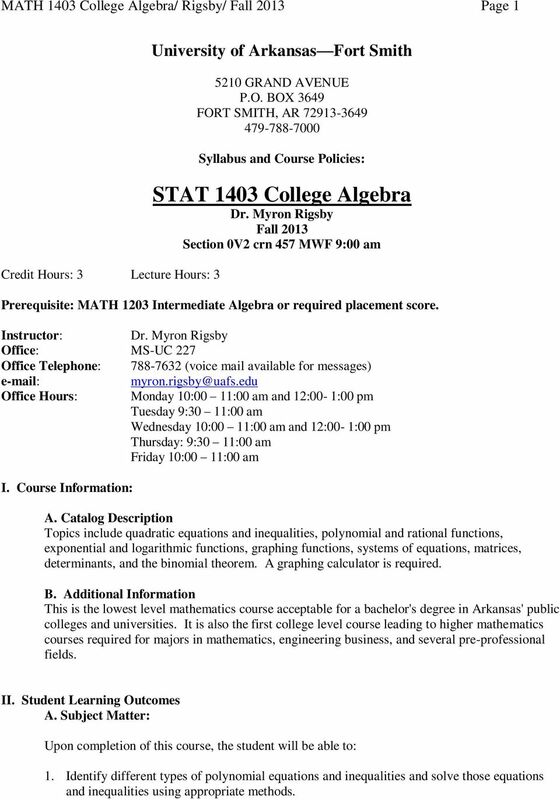 Download "STAT 1403 College Algebra Dr. Myron Rigsby Fall 2013 Section 0V2 crn 457 MWF 9:00 am"
1 MATH 1403 College Algebra/ Rigsby/ Fall 2013 Page 1 Credit Hours: 3 Lecture Hours: 3 University of Arkansas Fort Smith 5210 GRAND AVENUE P.O. BOX 3649 FORT SMITH, AR Syllabus and Course Policies: STAT 1403 College Algebra Dr. Myron Rigsby Fall 2013 Section 0V2 crn 457 MWF 9:00 am Prerequisite: MATH 1203 Intermediate Algebra or required placement score. Instructor: Dr. Myron Rigsby Office: MS-UC 227 Office Telephone: (voice mail available for messages) Office Hours: Monday 10:00 11:00 am and 12:00-1:00 pm Tuesday 9:30 11:00 am Wednesday 10:00 11:00 am and 12:00-1:00 pm Thursday: 9:30 11:00 am Friday 10:00 11:00 am I. Course Information: A. 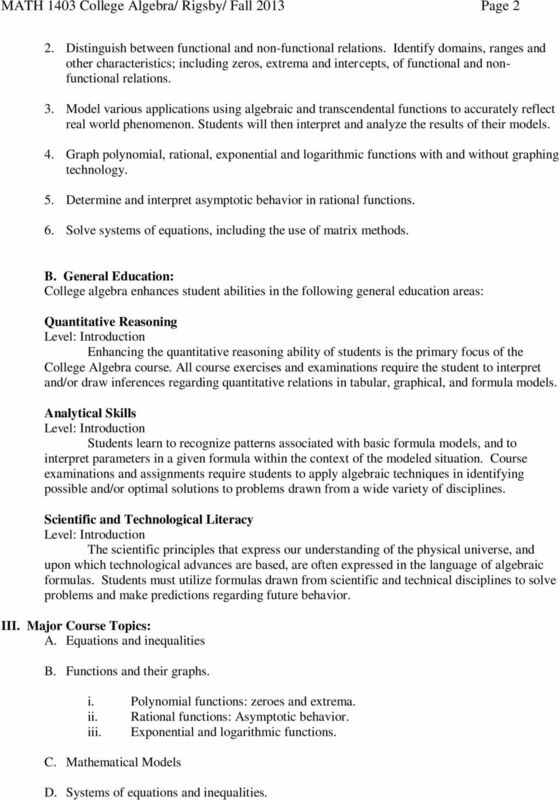 Catalog Description Topics include quadratic equations and inequalities, polynomial and rational functions, exponential and logarithmic functions, graphing functions, systems of equations, matrices, determinants, and the binomial theorem. A graphing calculator is required. B. Additional Information This is the lowest level mathematics course acceptable for a bachelor's degree in Arkansas' public colleges and universities. It is also the first college level course leading to higher mathematics courses required for majors in mathematics, engineering business, and several pre-professional fields. II. Student Learning Outcomes A. Subject Matter: Upon completion of this course, the student will be able to: 1. Identify different types of polynomial equations and inequalities and solve those equations and inequalities using appropriate methods. 2 MATH 1403 College Algebra/ Rigsby/ Fall 2013 Page 2 2. Distinguish between functional and non-functional relations. Identify domains, ranges and other characteristics; including zeros, extrema and intercepts, of functional and nonfunctional relations. 3. Model various applications using algebraic and transcendental functions to accurately reflect real world phenomenon. Students will then interpret and analyze the results of their models. 4. Graph polynomial, rational, exponential and logarithmic functions with and without graphing technology. 5. Determine and interpret asymptotic behavior in rational functions. 6. Solve systems of equations, including the use of matrix methods. B. General Education: College algebra enhances student abilities in the following general education areas: Quantitative Reasoning Enhancing the quantitative reasoning ability of students is the primary focus of the College Algebra course. All course exercises and examinations require the student to interpret and/or draw inferences regarding quantitative relations in tabular, graphical, and formula models. Analytical Skills Students learn to recognize patterns associated with basic formula models, and to interpret parameters in a given formula within the context of the modeled situation. Course examinations and assignments require students to apply algebraic techniques in identifying possible and/or optimal solutions to problems drawn from a wide variety of disciplines. Scientific and Technological Literacy The scientific principles that express our understanding of the physical universe, and upon which technological advances are based, are often expressed in the language of algebraic formulas. Students must utilize formulas drawn from scientific and technical disciplines to solve problems and make predictions regarding future behavior. III. Major Course Topics: A. Equations and inequalities B. Functions and their graphs. i. Polynomial functions: zeroes and extrema. ii. Rational functions: Asymptotic behavior. iii. Exponential and logarithmic functions. C. Mathematical Models D. Systems of equations and inequalities. 3 MATH 1403 College Algebra/ Rigsby/ Fall 2013 Page 3 E. Matrices. IV. Resources: A. Required Text: College Algebra, 4 th ed., Beecher, Penna, and Bittinger. You must purchase access to MyLabsPlus for the on-line homework, which includes access to an electronic version of the textbook. If you prefer a paper copy, you may purchase a bundled version of the textbook in the bookstore that includes an access code for MyLabsPlus and a paperback version of the text. B. Additional Required Equipment: Some sort of calculator will occasionally be useful. V. Conduct of the Course: A. Tests, Homework, and Grading Your grade will be based on in-class tests, on-line homework and weekly quizzes, and a comprehensive final examination. Tests: There will be four 100 point tests, spaced approximately 3 weeks apart. 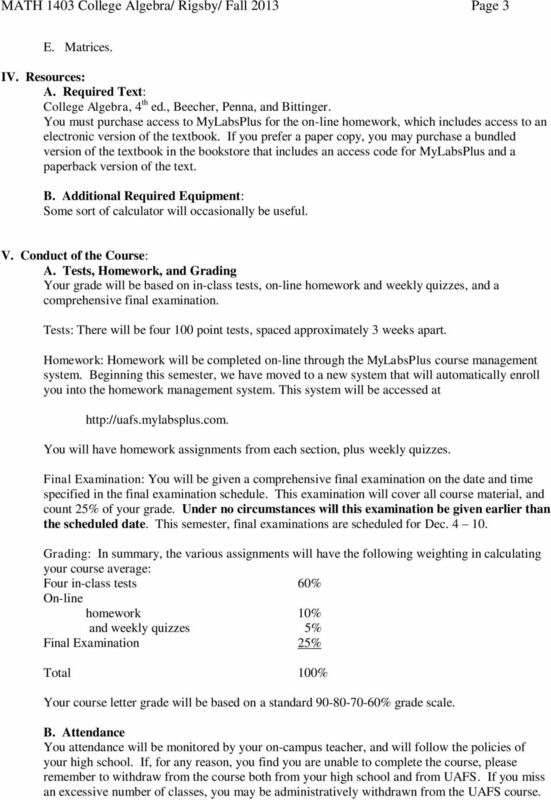 Homework: Homework will be completed on-line through the MyLabsPlus course management system. Beginning this semester, we have moved to a new system that will automatically enroll you into the homework management system. This system will be accessed at You will have homework assignments from each section, plus weekly quizzes. Final Examination: You will be given a comprehensive final examination on the date and time specified in the final examination schedule. This examination will cover all course material, and count 25% of your grade. Under no circumstances will this examination be given earlier than the scheduled date. This semester, final examinations are scheduled for Dec Grading: In summary, the various assignments will have the following weighting in calculating your course average: Four in-class tests 60% On-line homework 10% and weekly quizzes 5% Final Examination 25% Total 100% Your course letter grade will be based on a standard % grade scale. B. Attendance You attendance will be monitored by your on-campus teacher, and will follow the policies of your high school. If, for any reason, you find you are unable to complete the course, please remember to withdraw from the course both from your high school and from UAFS. If you miss an excessive number of classes, you may be administratively withdrawn from the UAFS course. 4 MATH 1403 College Algebra/ Rigsby/ Fall 2013 Page 4 If classes are not meeting in your high school and UAFS classes are meeting, you are welcome to attend class on campus at UAFS. The on-campus classroom is room 113 of the Business and Industrial Institute Building, which is the UAFS building closest to the traffic light at Grand Avenue and 50 th Street. If you are going to be absent from class because of a school function, I expect advance notice of your absence. C. Make-up Tests If you miss one hourly test during the semester for any reason, expect to take the exam the day you first return to class. 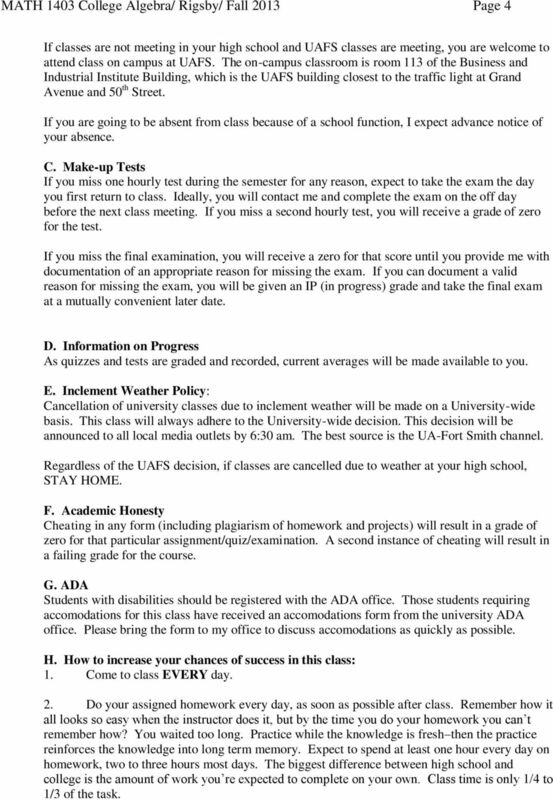 Ideally, you will contact me and complete the exam on the off day before the next class meeting. If you miss a second hourly test, you will receive a grade of zero for the test. If you miss the final examination, you will receive a zero for that score until you provide me with documentation of an appropriate reason for missing the exam. If you can document a valid reason for missing the exam, you will be given an IP (in progress) grade and take the final exam at a mutually convenient later date. D. Information on Progress As quizzes and tests are graded and recorded, current averages will be made available to you. E. Inclement Weather Policy: Cancellation of university classes due to inclement weather will be made on a University-wide basis. This class will always adhere to the University-wide decision. This decision will be announced to all local media outlets by 6:30 am. The best source is the UA-Fort Smith channel. Regardless of the UAFS decision, if classes are cancelled due to weather at your high school, STAY HOME. F. Academic Honesty Cheating in any form (including plagiarism of homework and projects) will result in a grade of zero for that particular assignment/quiz/examination. A second instance of cheating will result in a failing grade for the course. G. ADA Students with disabilities should be registered with the ADA office. Those students requiring accomodations for this class have received an accomodations form from the university ADA office. Please bring the form to my office to discuss accomodations as quickly as possible. H. How to increase your chances of success in this class: 1. Come to class EVERY day. 2. Do your assigned homework every day, as soon as possible after class. Remember how it all looks so easy when the instructor does it, but by the time you do your homework you can t remember how? You waited too long. Practice while the knowledge is fresh then the practice reinforces the knowledge into long term memory. Expect to spend at least one hour every day on homework, two to three hours most days. The biggest difference between high school and college is the amount of work you re expected to complete on your own. Class time is only 1/4 to 1/3 of the task. 5 MATH 1403 College Algebra/ Rigsby/ Fall 2013 Page 5 3. Take notes in class. Write down every sample problem, PLUS explanatory notes on the side reminding you why each step was done. 4. Take advantage of the available resources. Instructor: I expect to hear from all of you regularly with questions. If you come to my office, we can access your homework, or from within the homework there is a link to ask me a question, which sends me an with a link to the question you were struggling with. Math Lab: MS 238 is set aside as a study room and drop-in tutoring lab for mathematics students. Upper level math majors are available to assist you with homework and other course material. Hours of availability will be posted by the second week of classes.